Negotiations under way between Russian gas exporter Gazprom and Romania may result in a dramatic shift in the routing of the South Stream gas pipeline under the Black Sea, and in current relations between the Russian and Bulgarian governments, Bulgarian officials have told Fairplay. Gazprom’s deputy chief executive Alexander Medvedev was in Bucharest on February 17, where he met Adriean Videanu, Romania’s Minister of Economy and the heads of Romgaz and Transgaz, the Romanian gas producer and distributor. Romania produces roughly 60% of the gas the country consumes, and imports the remainder from Gazprom. The Gazprom archive records dozens of communiqués and announcements relating to the flow of Russian gas to Romania, which first began in 1979. Current deliveries are contracted until 2030 with two Romanian intermediaries, WIEE and Conef; these operate with the standard Russian function of masking Gazprom’s export delivery price, the Romanian buying and selling prices, and the profit retained offshore. WIEE Romania was founded in 2000 as a wholly owned affiliate of WIEE, Zug (Switzerland); that entity, whose acronym stands for Wintershall Erdgas Handelshaus Zug AG, is a joint venture involving Wintershall, Germany, (BASF Group) and Gazprom, first started in 1990. WIEE says on its website that it has sold more then 52 billion cubic meters of natural gas to Romania and approximately 8 billion cubic meters to Bulgaria. The current WIEE contract for 2010 to 2030 calls for WIEE to sell “up to” 5 billion cubic metres per annum of Gazprom gas to Romania. As will be seen shortly, Marco is controlled by the Russian-Israeli figure, Vitaly Mashitsky, whose alliances in Russian business are what make the latest news particularly sensitive. The February 17 Gazprom communiqué says that negotiations for Romania to join the South Stream pipeline project will continue this month, focusing on a plan, mooted last year, to build an underground gas storage accommodating up to 6 billion cubic metres of gas, and to consider routing South Stream further north than previously discussed with Bulgaria and Turkey. The Gazprom spokesman Denis Ignatiev did not give a location for the storage facility, nor did the Romanian Embassy in Moscow. Romgas currently says it operates six storages, with current capacity of 2.8 bcm. The locations – Balaceanca, Ghercesti, Cetatea de Balta, Butimanu, Sarmasel, and Urziceni – are at the cardinal points of the compass around Bucharest, well inland from the Black Sea coastline. Ignatiev told Fairplay: “It is too early to speak definitively about the gas storages to be used in Romania; the matter hasn’t been decided yet. The technical and economic feasibility study will show what route will be chosen. For the present moment, Bulgaria is the main option, but the Romanian variant is also being studied”. 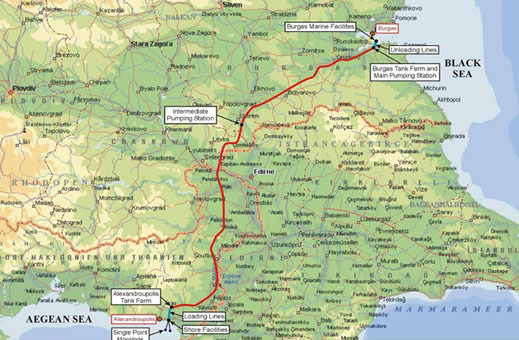 For the proposed South Stream pipeline route to reach a new Romanian coastal point would require the undersea pipeline to emerge from the Black Sea on the Romanian coast, more than 150 kilometres to the north of Varna, Bulgaria, where the pipeline is currently planned by Gazprom to come ashore. This also implies a strategic change in Gazprom’s routing, in order to place the gas hub for the project in Romania, instead of Bulgaria, and to divide the southward and northward branch lines in Romania, not in Bulgaria. To cross the Black Sea between the Russian and Romanian coasts would require significantly less underwater distance and less cost. Bulgarian sources say they now believe Gazprom is considering the pipeline route through Ukrainian and Romanian zones of the Black Sea seabed. There are serious political and commercial implications for everyone at stake. The Bulgarian government of Boyko Borisov, elected over the local socialist party last July, has been under pressure from his constituencies in the country to renegotiate the terms of Bulgaria’s participation in Russian oil, gas and nuclear energy projects, which have been in planning for years under the Bulgarian socialists. While public rhetoric in Sofia has focused on environmental concerns, anti-Russian xenophobia, and corruption, the Borisov government is reluctant to cede the importance of Bulgaria’s role as an energy transit hub for Europe to rival Russian plans assigning financially more lucrative roles to Turkey and Romania. To persuade Borisov, Russian tactics have been to emphasize how much Bulgaria will miss if Borisov doesn’t come round. Gas and oil pipelines make powerful leverage. 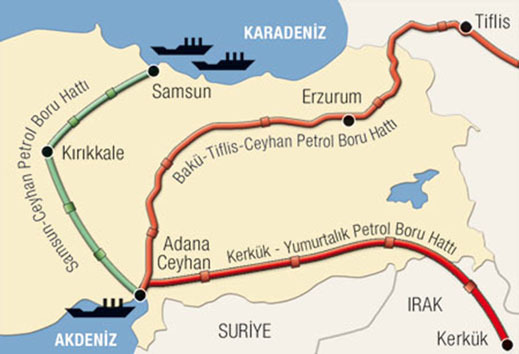 Uneasy bargaining is therefore under way over the routing of the crude oil pipeline, originally planned to run from Burgas, Bulgaria, to Alexandroupoli, Greece, and now proposed by the Kremlin to run from Samsun to Ceyhan, Turkey, on the opposite side of the Black Sea. Transneft, the state-controlled Russian company managing crude oil pipelines, suggested last month that it is ready to consider building both crude oil pipelines, but Transneft also claims the decision on the route depends on Borisov. “We are worried by the position of the Bulgarian side,” Fairplay was told by Transneft spokesman, Igor Dyomin. “We have sent several applications to find out the Bulgarian position on their participation in the project, but we haven’t received any answer yet, so the official Bulgarian position remains unknown to us. It is unclear what Transneft means when it refers to doubt about the Bulgarian financial participation in the project. 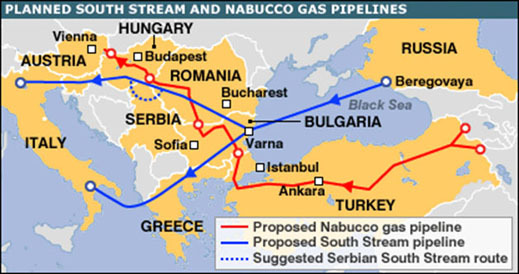 According to the website of the project company, Trans-Balkan Pipeline B.V., the “single Bulgarian participant (Joint stock company “Project Company Oil Pipeline Burgas-Alexandroupolis – BG” AD) was founded jointly by the holding company “Bulgargas” (50%) and “Technoexportstroy” (50%).” The Bulgarian stake is 24.5%; the Greek stake is the same; and the Russian stake, shared between Transneft, Rosneft, and Gazpromneft, all state-controlled entities, is 51%. Bulgarian sources say that Borisov has just passed the mandate to negotiate with Moscow to a new man. He is Semeon Djankov, the World Bank economist who has been Deputy Prime Minister and Minister of Finance in the Borisov government since last July. Until now, negotiations with the Russians on pipeline issues have been led by Energy Minister Traycho Traykov. Djankov is reportedly confident that if there is a shortfall in Russian crude supplies for the Trans-Balkan Pipeline, Chevron will make up the difference in crude lifted at the Kazakh oilfield of Tenghiz. That may be piped across Russia to Novorossiysk, and across Georgia to Poti. Bulgarian sources acknowledge that the Kazakhs too have still to make up their minds about where on the Black Sea’s western coast to concentrate their crude shipments. Since August of 2007, the state owned KazMunaiGaz has owned 75% of Rompetrol, the Romanian refiner and petroleum retailer. The Russian decision to build the Samsun-Ceyhan crude oil pipeline surfaced last October with Deputy Prime Minister Igor Sechin, who supervises Russia’s energy concessions and chairs the board of Rosneft, the leading oil producer and exporter. Sechin doesn’t report to the Russian parliament, and he has made no public explanation for his preference for Turkey. The intermediaries who benefit from the new routing include Turkish and Italian companies, who would play no part in the Trans-Balkan pipeline. Rival oil trading interests and shipping interests benefit if the Russian crude is loaded at Ceyhan, instead of Alexandroupoli. 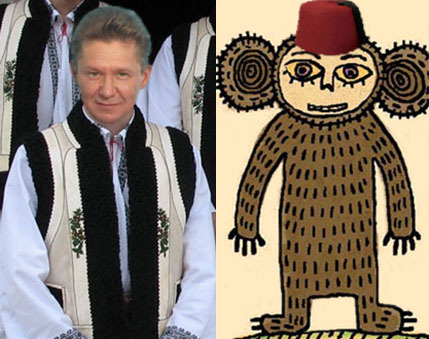 Sechin and the Gazprom administration, led by Alexei Miller (see left image), have had an uneasy administrative and personal standoff for years. There is no telling, at least in public, how they differ on the strategic issues of dealing with these Black Sea pipeline routes. Sechin’s office declines to answer questions on these matters. But when Sechin first disclosed that he had agreed with the Turks to build the Samsun-Ceyhan pipeline, he claimed that he was obliged to do this in order to secure Turkey’s agreement to allow Gazprom to lay the mid-seabed section of the South Stream pipeline across the Turkish Exclusive Economic Zone (EEZ). 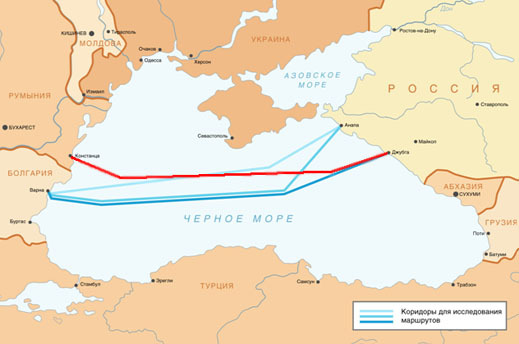 Now Gazprom appears to be implying that it doesn’t need the Turkish EEZ, and won’t want Ankara’s consent, because the pipeline may be laid further north, in the Ukrainian EEZ. The Bulgarians have told Fairplay that if Gazprom revises its undersea route for the gas pipeline, this will require “at least two years” of negotiating with the Ukrainian government before permission to cross Ukraine’s EEZ will be secured. Romanian press reports hint that Gazprom’s new arrangements for gas delivery – a state secret in Romania — may involve a change in the non-Romanian intermediaries which have been involved in gas sales and distribution in the country to date. It is hinted that Romgaz, the state-controlled producer and distributor, may buy directly from Gazprom, instead of through WIEE and Conef. Although the latter’s contract volumes may be preserved, if extra volumes of gas come ashore in South Stream to a Romanian hub and storage centre, WIEE and Conef will not be the beneficiaries. The Romanian Embassy in Moscow is reluctant to acknowledge the scope of the Gazprom plan: “The negotiations about usage of gas storages are going on between Gazprom and Transgaz, and the information is confidential for the time being”. If both Gazprom and the Romanian government are reluctant to spell out what is at stake, then what of Mashitsky, the Marco group, and Conef? As the Marco name implies, this was a company first created by Marc Rich, the US commodity trader based in Switzerland. An American protégé of Rich’s, Alan Kestenbaum, appears to have introduced Mashitsky into the businesses of both Marco and Conef in Romania, before Mashitsky took control for himself. He remains an oligarch-sized figure in Romania, with many interests that include aluminium smelters and alumina refineries. These depend on cheap gas. If a sea change is being considered right now in Gazprom’s relations with Romania, then Mashitsky’s fortunes are also at stake. A spokesman for Mashitsky’s aluminium holding in Bucharest did not reply to questions about this.